Ok, just the material wishes…. What I really love is handmade stuff (and not just because I am a maker of handmade goods)…. I have a million things I adore on Etsy.com and SmashingDarling.com that I would love to put in a wishlist… Etsy has a favorites list but I tend to favorite things either I want to give to someone else or that I want… Last year I wound up with a really cool nitroglycerin holding keychain from hubby. Um, I’m not on nitroglycerin…I can’t remember who I earmarked that for, but it wasn’t me…. So until that allows for greater organization and clarification I am so excited that Amazon now has a Universal Wish List button that you can add to your browser. You can add anything from anywhere. It adds a title, image, and link…You can put a description and the price if you would like… When someone views your wishlist they just click and bam! they are on the item page… The only potential issue I can see on this is that checkout will of course be with the linked site, not with Amazon…Might confuse those who are not yet familiar with venues like Etsy… For now though I am hoping it brings more exposure for the fabulous Etsy (and all of us who peddle our handmade goods there…Me included, of course…) and a great way to organize and add to wishlists…. Here’s a link to the button! 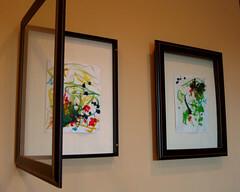 Now head to Etsy.com and have fun! Enjoy! Not really type-A at all….But I have to be… For the boy…. 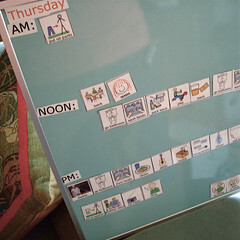 The magnets were made by me using the Make-a-Schedule software from Do2Learn.com …. The magnet board/scheduling like this is not easy. Right now it and helping boy with the tasks on it are all consuming. I’m exhausted and burnt out but boyo is doing great. This is helping in a huge way with transitions- it’s like he can fight with us and totally lose his marbles, but the pictograms are irrefutable…. It’s a pretty obvious solution to my small-parts storage needs (in this case my bead collection) but it took awhile to get here…. I researched a few options, and eventually decided to invest in a steel literature sorter- like the ones used in schools as mailboxes for the teachers… Sheesh, again with the old office stuff floating my boat….. I already had all of these (ok. 30 of them, 24 are being used, 6 are just waiting for occupants) small parts boxes with lids… I figured I could put them in my (rather large considering I’m not a clothes junkie) closet and give each box a bin….Nicer and easier and less noisy (and frankly, hard on my old bones and muscles these days which really don’t take kindly to much lately) than pulling them in and out of the plastic caddies they came with. Well, earlier this week I took another look at topdeq.com’s offerings (I have been getting their catalog since way back when) and my brain just decided to do the math…. 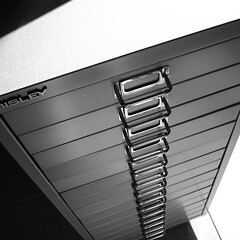 I realized I could fit 2 tackle container things in each drawer- totally releasing the concept of buying the Bisley brand drawer dividers (at $10-$18 a pop and still not enough spaces per drawer for my liking)…. I wound up with this beauty…. This is a Bisley unit, purchased from Topdeq.com, and delivered yesterday by freight. It has 15 drawers…Each drawer measures 2″ x 12″ x 16″…. Each drawer fits two of my little small part tackle boxes with a little wiggle room- just enough to put that hank or two, or bag of beads, where I can have a visual reminder of it (hugely important with my ADD and creating- I tend to have stuff everywhere because with me out of sight out of mind holds so true) when I open up the drawer of similar beads…. Anyway, this came with a plinth (steel riser) and I bought the caster attachment to go with the unit… So off came the plinth and on went the casters…. I busted the hinged lids off the little divided containers -with some success…. On some I had to cut a hinge, but the lids still fit on top, and if and when we do move and I need to transport everything I can just use some of those fabulous “h” rubber bands to hold everything secure…. And easily stashable (fits in the hall closet/linen closet…. Also tucks under my elevated kitchen bar area (43″ tall….Bisley unit is around 36″ I believe)…. and of course easy enough to use for a quick bead sort that I won’t put it off until I have a gallon bucket of loose beads (like now. *gulp*)…. It was delivered super fast- I ordered Monday night and got the call about delivery on Wednesday… Pretty awesome. And for the amount of space and comfort and peace of mind this creates, it was totally worth it, and no more expensive than the various other solutions I was looking at. Actually, as the drawers are such a great size, and not too deep, I wound up saving money and space…Yay! I just need to pen some pretty labels for the drawers…. Oh and here is a picture of one of the drawers (with a freshly started small parts, tackle bin/thing, hence it has space to add more yippee!)…. My only cons about this purchase: I was instantly aware upon unpacking that I have many more spaces in my studio and home for rolling steel units and I have a pretty clear idea of what drawer sizes I need and hey, add a sturdy top to these badboys and I have a nice packing table…. Woohoo! Also- the drawers don’t have stops. *gasp* So I will have to rig some up… Boyo has been warned that the drawers are not to play with, and I told him a dramatic bedtime story about what would happen if a drawer was pulled too far…. It involved beads, the shortcomings of our vacuum, and the dynamics of hard round things on tile flooring and tender little foot-soles…. I’ll list some of the other options I looked at shortly…. 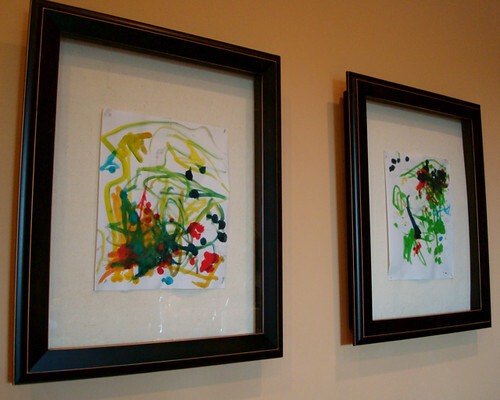 Some cool things for storing for folks like me that are combining family and work and art and then taming them into a happy and less frustrated ball of goodness.